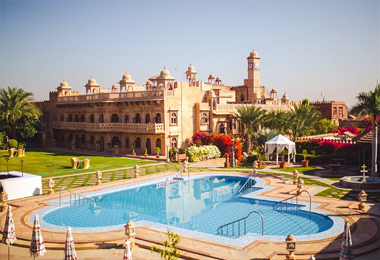 Located on the road between Bikaner and Jodhpur, Khimsar is a beautiful village of the Nagaur District. Every year, tourists from all across the world visit this village to observe the traditional lifestyle of the village people residing here. Home to several monuments and forts, it also houses a number of mosques but the most popular one was erected by Mughal Emperor Akbar. The Nagaur Cattle Fair organized here every year is a major crowd puller. For discerning travelers who come here from all around the world, there are Heritage Hotels in Khimsar where both leisure and business tourists can have a comfortable stay. The huge luxurious rooms of these hotels have been slightly renovated to meet the needs of today’s tourist but the royal feel has been kept intact. The rooms and suites are well-furnished and well-equipped with amenities and services like air conditioner, attached bathrooms, royal bedspreads, mini bar, tea-coffee makers, and so on. The needs of both leisure and business traveler can be met here. The list of hotel facilities is also long including gym and health club, swimming pool, indoor and outdoor activities, restaurant with multi-cuisine and specialty food items, internet and more. Through Heritage Hotels of India, while being in the comfort of your home, you can make an online booking.